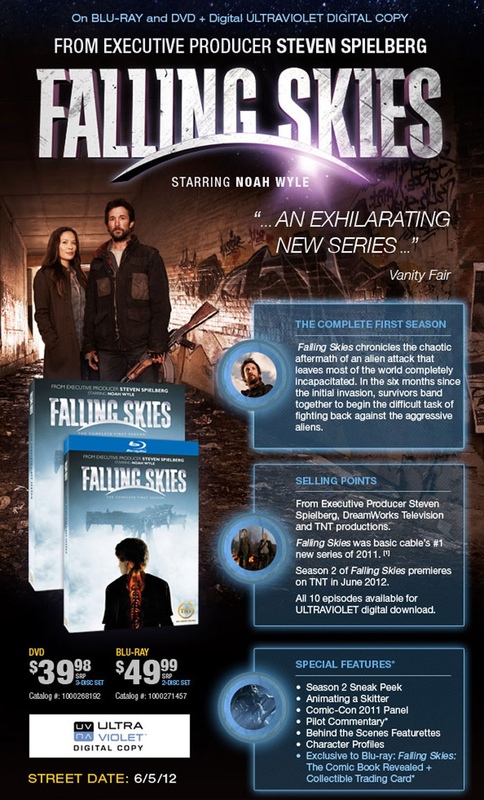 TNT has announced the DVD and Blu-ray release date of one of my favorite shows from last summer,FALLING SKIES: The Complete First Season for June 5th. All 10 episodes of the first season are included and will include a commentary on the pilot episode, an Animating a Skitter feature, a Comic-Con 2011 Panel, behind the scenes featurettes, character profiles, and a season 2 sneak peek. The Blu-ray release will also include a Falling Skies: The Comic Book Revealed featurette, and a collectible trading card.